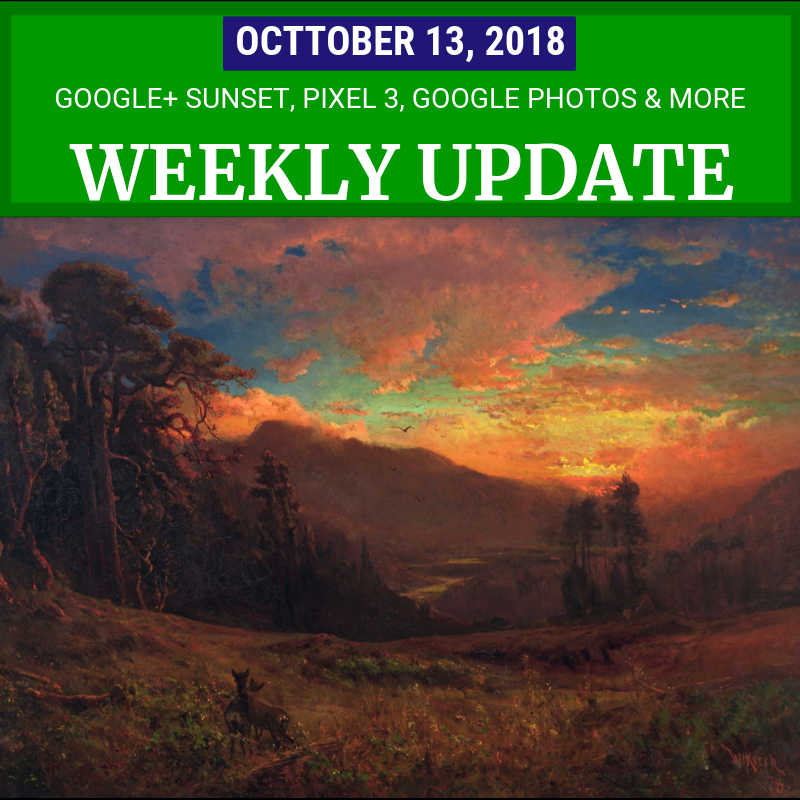 I am still working on a detailed write-up up my thoughts on the demise of Google+, but here’s an overview of what’s happening: on Monday, Google announced they had discovered (and fixed) a bug that may have revealed some user Google+ profile information to developers. Oh, and because of low usage and the “significant challenges in creating and maintaining a successful Google+ product that meets consumers’ expectations” the consumer version of Google+ will shut down by August 2019. The official Google+ Page didn’t make even a minimal announcement until the next day. There have been no details about what will happen to user accounts and the Google products that are still integrated with Google+. The initial response from the tech press mostly focused on the data-exposing bug. Since then has been a lot of confusion and some understandable sorrow and bitterness from long-time and dedicated Plussers, who understandably feel poorly treated by the abrupt announcement and lack of information. In any case, I feel that way. However, I think the folks on the Google+ team do care about us few who are active on Google+. On Friday the Google+ Page posted a more complete announcement, with comments open. And I’m hopeful we will get more details soon about how the shutdown process will work. I plan to be on Google+ for a while yet, I plan to post more content first here on my blog (peggyktc.com) and I’ll continue sharing to Twitter (@peggyktc). Google+ isn't really dead, because Google announced new features for enterprise customers that will be available in the coming months. Admins will be able to review and moderate employee posts, there will be new ways to direct and discover content with tags, admins will be able to create custom streams for employees, post analytics and more. But what about that bug in the Google+ People API that exposed user data to developers? Google says it only involved “static, optional Google+ Profile fields including name, email address, occupation, gender and age”, was limited to up to 500,000 Google+ accounts. They have no evidence that the data was misused or that developers even knew about it. It sounds like the privacy implications may not be that significant. But what is bad is that the bug was discovered and fixed back in March, but not revealed at the time “because of fears that doing so would draw regulatory scrutiny and cause reputational damage”. That comes from internal Google memos obtained by the Wall Street Journal, which they published an article about - probably not-coincidentally - on Monday. It remains to be seen whether there are any repercussions for Google. * On Android devices consumers will get more fine-grained control over what account data they choose to share with each app. What I thought I’d be focusing on this week was Google’s big hardware event on Tuesday. The new Pixel 3 and Pixel 3 XL were announced, with a mighty notch on the XL and deep integration with Google Assistant. Put your Pixel 3 on its wireless charger and it becomes a smart home hub, it can screen potential calls for you and it will be the first phone where the Assistant make restaurant reservations for you and to get Smart Compose in the Gmail mobile app. And the camera has some cool features noted below. Google also announced the Google Pixel Slate tablet with Chrome OS and the Home Hub smart hub-with-a-screen, along with an updated version of the Google Home app. It may or may not be significant that Google apparently didn’t mention “Android” once during the event. The Pixel 3 cameras have great hardware specs, and a bunch of cool software features, Motion Auto-Focus and video stabilization on front and back cameras, Group Selfie to include everyone, Photobooth Mode that uses AI to decide when to snap the picture, and Playground augmented reality mode with Playmoji that can react to you and with each other. Google Photos also launched Live Albums, that automatically update with photos of specific people or pets. Live Albums can display on the Google Home Hub and the Pixel 3 on its wireless dock. And Google Photos lets you select a different “Top Shot” in a series taken by the Pixel 3 and edit the background on Portrait mode photos. * The Google Top Contributor Program is now the Google Product Experts Program. Learn more. Plus there are more tips and updates for webmasters, AdSense Publishers, YouTubers, Plussers and more. Read on for details. Click the link below for details. This is one of the biggest problems with Google: it tries to do many things and, so, ends up doing it poorly. I'm already traumatized, in terms of trust, because of the end of Orkut and Google Reader, now this. Can we trust the future of Blogger, which is an extraordinary product? There are no guarantees, of course, but I haven't seen any indication Blogger is in imminent danger of being shut down. And Blogger content exports can be imported into WordPress or other content management sites. If you want to be sure that what is yours stays yours, you can also get a custom domain, which you can take with you if you move to another platform. Yes, thank you, I know these resources, but what would help Blogger would be the return of community initiatives, such as the old "Blogs of Note", that integrate users and give us certainty that the company listens to us (in this subject, I defend a premium version, with direct communication with Google employees, such as Google One).